Dry, tickly or chesty coughs normally linger in our systems for a couple of weeks, sometimes outliving other viral symptoms such as headaches or blocked noses. However, if they become too prolonged it can be a cause for concern. 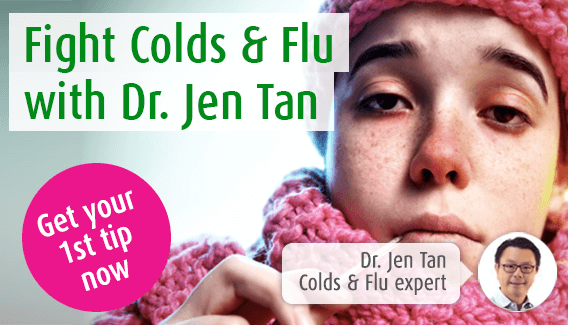 In this page, Dr. Jen Tan discusses symptoms of a persistent cough and examines the underlying medical conditions that can cause this affliction. Coughs can be a nuisance at the best of times, but they tend not to last for more than a couple of weeks. However, when they linger for more than three weeks, this is considered to be a persistent cough. Although many persistent coughs can arise as a result of the residue of a viral infection such as the cold or flu, if you are concerned, you should get it checked out by a doctor to rule out a serious underlying cause. This page describes some of the conditions your doctor will be thinking of. Could it be an infection? One of the most common causes of a cough is a cold or flu virus. However, this type of cough should clear up relatively quickly. If it persists, this may indicate that you have developed some form of bacterial infection. This is the most common cause of persistent coughs. It can be difficult to tell if your cough is being caused by a bacterial or viral condition, but it is important to seek a diagnosis from your doctor, as the treatment will be different. A bacterial infection may require treatment using antibiotics, and this will have no effect on a viral infection. This is a respiratory disease which affects the airways. When a trigger enters the airways of an asthma sufferer, the airways constrict and the mucous lining swells. This narrows the airways, making it difficult to breathe and often results in a wheezing sound as the air travels through the respiratory passages. Some people with asthma may also suffer a chronic cough – either with or without wheezing. The reason for this is that narrowing of the airways causes irritation of the cough reflex, resulting in persistent coughing. Asthmatic coughs are usually dry coughs, typically worse with exercise or may wake the sufferer up in the middle of the night. Although some people ‘grow out’ of asthma after having suffered from it as a child, other people have asthma for their whole life, or develop it later in life. It cannot be cured; however, with the help of your doctor it is a condition which can be effectively managed. This is a term which covers a myriad of heart problems. When the heart is struggling to pump blood effectively around the body, fluid can accumulate in the lungs (and other parts of the body). Aside from difficulty breathing, asthma-like symptoms of wheezing may develop. The cough is likely to be a productive mucous cough, which may be worsened when lying down. In addition, some heart disease medications can give rise to a persistent dry cough. Heart disease symptoms should be managed by your doctor. If you have been diagnosed with heart disease and you notice a worsening of your symptoms, you should seek medical attention. Could it be a lung problem or cancer? A cough occurs when your body is trying to clear your lungs so that they can work more efficiently. If you have an infection or damage to tissue, you may cough more than normal in an attempt to clear the irritation. Lung diseases are wide ranging and include conditions such as emphysema and sarcoidosis. Emphysema is a condition in which small air sacs in the lungs become enlarged or burst, making it more difficult for carbon dioxide to be efficiently expelled from the body. Sarcoidosis is a condition in which lumps of abnormal cells grow in various parts of the body, but particularly the lungs. Although many people experience no symptoms with this condition, others may develop wheezing and a chronic cough. A persistent cough can also be a sign of lung cancer. This is the case for about 2% of persistent cough sufferers. Lung cancer occurs when normal cells in the lung grow out of control. The most common cause of this is smoking. Whooping cough is caused by a bacterial infection called Bordetella pertussis. It is highly contagious and is characterised by a distinctive ‘whoop’ sound during coughing. As a vaccine has now been developed against whooping cough, it is no longer a common condition. It is now more likely to occur in adults than children, as immunity against it has decreased. The condition can be treated with antibiotics and should not pose further health problems. However, it is important to treat the condition carefully, and ensure you get plenty of rest and fluids until you are clear of infection. Tuberculosis (TB) is a bacterial infection which mainly affects the lungs. Although more common in less developed countries, the incidence (or frequency) of TB in the UK is rising again. However, unlike in the 1900s when TB was difficult to treat and death rate with the infection was high, with the help of antibiotics, this is no longer the case. Symptoms of TB often include a chesty mucous cough. As the infection develops, the cough worsens and there are often spots of blood in the mucus.